I am trying to re-gain control over the blog award nomination process, or I pretend to do so. postmoderndonkey had called it a Mad Tea Party of a nomination process – and right he was. You may accuse me of making this blog the strange attractor of a self-referential loop of weird referrals to itself and to blogs of like-minded subversive elements – and right you are as well. 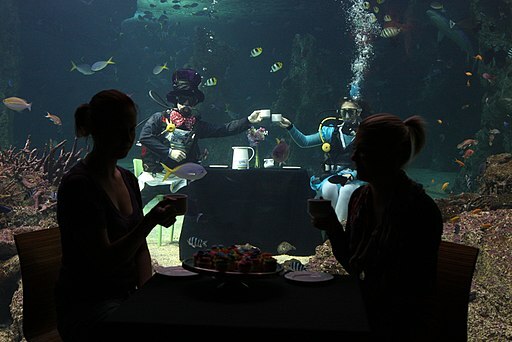 Mad Hatters Tea Party as they celebrate it in Sydney today or probably all over the world (Wikimedia). Pardon my ignorance, but I had always figured the Tea Party being related to US politics? For the first time on this blog, or the first ever, The Subversive El(k)ment has played by the rules when accepting an award. But I am not a role model, obviously, as the report of the Global Blog Award Acceptance Policies Enforcement Task Force Initiative proves in the most shocking way. There are philosophers and writers nominating each other back and forth, breaking the non-tag-back-rule and putting the causal structure of spacetime at risk. Others simply say they will ‘add more items later’ – as if this were an option! Or they post their – not even fully compliant – reply to the comments’ section of your well-craft nomination post. Until some postmodern writer decides to nominate the whole galaxy and to declare the ellipsis a trophy. The most subversive blogger was compliant with the rules, but found a loophole in the non-tag-back directive which made this response probably the most subversive. I do not disclose the identities of the subversive bloggers for confidentiality reasons. I am just adding some random collection of links. Google shuns spammy pages containing too many links, so chances are this post of mine will not be indexed by search engines and your online reputation is not damaged (even more). And nearly half of them don’t work anymore ⛔, in 2019. If this link does not point to a specific post it might be due to a non-existent acceptance post as the reply has been posted to the nominator’s comments section. But all this is not your fault. It is the lack of policies and processes as we use to say in The Corporate World. The originators of blog awards obviously don’t have any training in quality management and writing Those Important Guidelines. You should have hired overpriced management consultants instead. They would have written five volumes of seemingly great formal content on behalf of you, even if they just cut&pasted half of it from Wikipedia. I am speaking from experience here, but I cannot give you the details, otherwise I would be Liable and Doomed According to This Agreement On Confidentiality. Define terminology: If you are nominated by somebody nominated by somebody else you have just nominated – is this tag-backing? Or should we call it tag-tag-backing? Tag-backing to the power of two? Or does the strength of the tag-back decay exponentially with the distance from the tagging person (distance as to be defined as the metric in the blogosphere hyper-dimensional vector space). Define deadlines: There is no ‘adding items later’! You need to be assigned a task in The Corporate Resource Management Tool, report on your non-progress daily by checking red / amber / green of an iconized traffic light. The status as such does not result in any consequences, but not reporting on it does. Define responsibilities unambiguously: Even if this (1) counts a tag-backing – are you as the nominee accountable for tracing the chain of nominations back? Back over how many hops? How are you going to document this for future reference (Documentation = proof of this being Someone Else’s Fault). Define your org chart: Committees, working groups, regular meetings. You need controls! The award logo must not mutate – as any change (“change” as to be defined in the Change Management Guidelines) needs to be approved by The Blog Award Corporate Identity Group. copyright issues associated with the standards process. Be liberal in what you accept, and conservative in what you send. The standardisation process does not need to be as tedious as it sounds. In contrast to management consultants, internet engineers are subversive. If any management consultant has ever followed this blog, he/she might unfollow now – but as a disclaimer I’d like to add: I have been a consultant, so I speak – as usual! – from experience. The web is world-wide. HTCPCP is based on HTTP. Did USER-SERVER in the wabe. 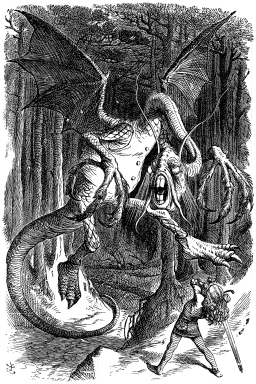 According to Chesterton and Green and others, the original purpose of “Jabberwocky” was to satirize both pretentious verse and ignorant literary critics. It was designed as verse showing how not to write verse, but eventually became the subject of pedestrian translation or explanation and incorporated into classroom learning. There is no conclusion! Feel free to start reading at the top again – the structure of this post is an isomorphism to the endless tag-backing loops closing on itself. But I think it is obvious that I am pondering about founding a new blog award myself, isn’t it? This entry was posted in Life the Universe and Everything and tagged Art, Award, Blogging, Corporate World, Geek Collection, Internet, Metrics, Poetry, Quality Assurance, Random Thoughts, RFC, Satire, Standards, Weird, Writing by elkement. Bookmark the permalink. Elke, one of the reasons I like blogging is that it provides me a ‘no holds barred’ release from my job. As I work at a Department of Education, as you might expect I have to spend my work time being very mindful of a complex set of rules and protocols. Oh, and I have added “Elkement” to both the browser’s and the word-processor’s local dictionary. I can relate so much to what you say about your relationship with rules and protocols. They have been haunting ever since: corporate policies, IT security standards and now finally standards for the power grid, heat pumps etc. Of course I know the Vulcan Mind Meld 😀 😀 WordPress should really provide proper software interfaces here – allowinging to attach some electrodes to your temples and connect them via USB or a yet to be invented cycer-something-mind-connector interface to your PC and to the whole blogosphere. But chances are high this would ne misused by Borg-like species, in particular in The Corporate World. And I really, really wanted to write something more serious this time – about professional networking platforms and profiles, as I promised some posts ago… I need to think about it – probably all my wisdom about the corporate world and networking is contained in this post nonetheless?! I like your suggestion of the nomination not yet being equal to being awarded – it reminds me of the three-way-handshake in TCP/IP: SYN – SYN/ACK – ACK. (OK, sort of – but I need to stick with my internet standards analogies to prove they are useful :-)) Thus in order to finish the set of steps correctly the nominee who has finally really been granted the award has to say the pass phrase in order to acknowledge receipt (publish and sign with a digital signature, I would invent digital blood for that matter). To tell you a secret – actually I wanted to make this post the “seeding post” initially, but then I decided these would be too much narrative levels, even for my most loyal followers. And I haven’t hired my consultants yet. I wanted to call it the Subversive Blogger award, but Michelle has informed me (in the comments of her subversive post on the award) that there is already another subversive award, but mostly awarded to blogs on religion. But probably it is more fun to make the name more obscure – so that one day I will be given this award by a blogger who does not know that I am the originator. I haven’t laughed this hard in a long time. 🙂 🙂 🙂 and 🙂 definitely 4 out of 4 grinning faces. I am going to link back into this post from this sentence: “Every once in a while this space [my blog] succumbs to the questionable intentions of a semi-subversive group of maverick blogging geeks.” Which refers to the rest of you, Liebsters, Elke included, intended with the greatest respect and warmth. Thanks, Michelle! I was not sure if this post was probably too much 😉 .. but there cannot be enough subversion in this (business) world! After you conquer Google, you will require Microsoft spellcheck to uphold a unified standard, of course.